Some thoughts from this past Sunday. is rocking my world: "Isn't it a comfort to worship a God we can not exaggerate?" 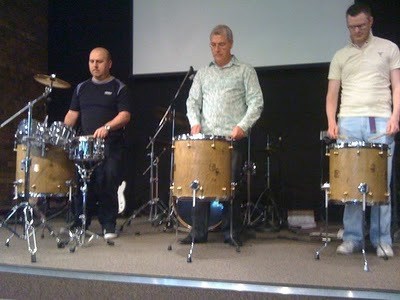 mark started teaching a brand new series at MKCC - In Rhythm. Him, Ed & Gareth did a brilliant job illustrating Rhythm with drums. Never seen Mark concentrate so much. We have the wonderful opportunity to get in rhythm with the heartbeat of God. God is not in the spam e mail business. God speaks to all of us by name. He wants us to know His voice. Maybe it's time to quit pursuing the latest book, podcast or preacher on The God Channel and spend some of that time running after God. God is continually calling us from religion to a relationship of intimacy with Him. Spent the afternoon watching the British Formula 1 Grand Prix. Quote of the day from Mark Webber after winning even though he seemed to get the wrong end of the stick from his own team. "Not bad for a No 2 driver."